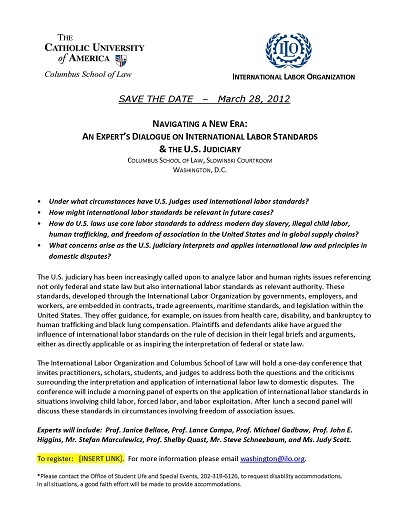 "Navigating a New Era: International Labor Standards and the U.S. Judic" by Lance Compa, Stefan Marculewicz et al. The U.S. judiciary has been increasingly called upon to analyze labor and human rights issues referencing not only federal and state law but also international labor standards as relevant authority. Whether another nation’s laws or legal precedents should affect American jurisprudence remains a highly controversial question. It lay at the heart of a one-day conference held at Catholic University’s law school on March 28th, 2012. The program, co-sponsored by CUA Law and the International Labor Organization, brought together leading scholars in the area of international labor law to address both the questions and criticisms surrounding the interpretation of international labor law and its application to domestic disputes. The event’s keynote speaker was the Hon. Peter J. Messitte, U.S. District Court Judge for the District of Maryland. Compa, Lance; Marculewicz, Stefan; Scott, Judy; and Higgins, John, "Navigating a New Era: International Labor Standards and the U.S. Judiciary- Panel Two" (2012). Other Lectures & Events. 8.